Specialty cut whole salmon - skin-on, bone-in, headed and gutted, known as "H&G Salmon" are ready for you to trim as you like, or stuff and roast the whole body. 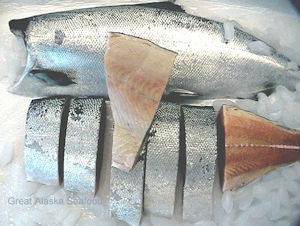 The Alaskan sockeye is a joy to cook and delectable to eat. Famous for their rich flavor, a well-cooked sockeye is an incredible treat. The distinct, deep red flesh retains its color throughout cooking, and its high fat content keeps the flesh moist. Average size is 4 lbs. Flash-frozen. $14.95/lb. Whole fillets are available also. Caught in the pristine waters of Cook Inlet, our coho salmon are processed same day of harvest. 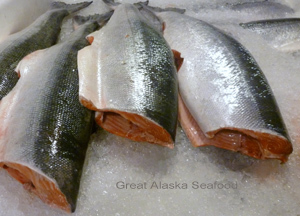 These 100% wild, pure salmon have a bright orange flesh, firm texture and delicate flavor. Sizes range from 4-9 lbs. Flash-frozen. These Sushi-grade, troll-caught King Salmon have nickel-bright skin and rich red meat. There is no better wild king salmon available unless you catch it yourself. High in heart-healthy Omega-3 Oils and huge in flavor. $25.95/lb. Please call us at (866) 262-8846 to order. 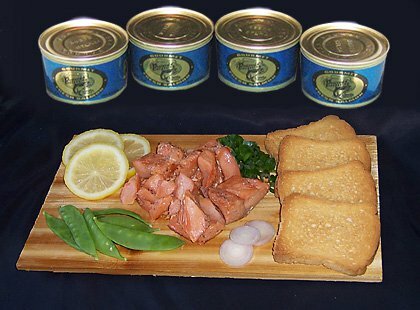 H & G Salmon cannot be ordered on-line. 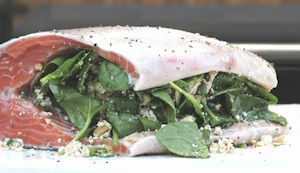 Whole fillets are available also. White kings are identical to other king salmon in appearance, however the flesh is pearly white and softer than the more common red kings. The taste is buttery and silky, less meaty and milder. $25.95/lb. Please call us at (866) 262-8846 to order. 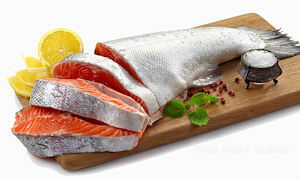 H & G Salmon cannot be ordered on-line. Sizes: 5-7 lbs and up. Flash-frozen. 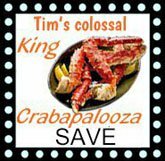 $24.95/lb. Please call us at (866) 262-8846 to order. H & G Sablefish cannot be ordered on-line.